Medical scientists masquerading as saints are once again invoking a familiar religious symbol to describe a new vaccine they are creating. The term "the Holy Grail," which refers to the chalice Christ drank from at the Last Supper, has been used frequently in the past by vaccinologists creating vaccines they want the people to purchase and use on a mass basis. This time scientists working for drug companies in Great Britain and Switzerland are referring to a "universal" vaccine they say will banish type A influenza infection from the earth - and prepare the way for a similar universal type B influenza vaccine. The assumption that preventing humans from ever experiencing type A (or type B) influenza will result in superior long term health is not based on scientific evidence. Like a religious belief, that assumption is based on faith. It is no wonder the vaccinologists are using religious symbols to describe their new vaccines. They have forgotten who they are. Or perhaps they just want people to believe they - and their creations - are holy. Experiencing infectious disease, including influenza, has been part of the human condition since man has walked the earth. Why do vaccinologists insist on assuming that the human immune system is incapable of dealing with that experience? Or benefiting from it? Where is the evidence that it is good to never, ever get the flu? Or that "universal" vaccines will not put pressure on microorganisms to mutate into vaccine-resistant strains? Those who use religious terms to describe the vaccines they want people to believe in and buy may well be asking mankind to use the product based on faith, not scientific evidence. "Experiencing infectious disease, including influenza, has been part of the human condition since man has walked the earth"
". . . If the State can tag, track down and force citizens against their will to be injected with biologicals of unknown toxicity today, there will be no limit on which individual freedoms the State can take away in the name of the greater good tomorrow." 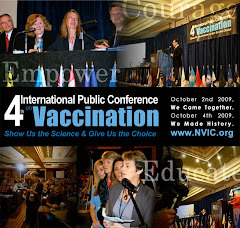 I am the Co-founder & President of the National Vaccine Information Center, the mother of three children, a writer and speaker on vaccination and informed consent issues. by Harris Coulter and Barbara Loe Fisher, co-founder & president of NVIC. The first major book (1985, Harcourt Brace Jovanovich) to critique safety flaws in the mass vaccination system and expose the dangers of the DPT vaccine, including the link between vaccine induced brain inflammation and autism. Referenced with scientific studies and more than 100 case histories of vaccine injury & death. There are some things that never change. A classic. Available by making a donation of $50 or more to the NVIC. Click on the image to donate and receive this book. by Barbara Loe Fisher. A new book documenting the link between complications of infectious diseases and vaccines which can result in chronic inflammatory diseases and disorders such as autism, learning disabilities, ADD/ADHD, seizure disorders, severe allergies, asthma, diabetes, inflammatory bowel disease and other chronic illness. Anchored with more than 200 references. Available by making a donation of $25 or more to the NVIC. Click on the image to donate and receive this book. 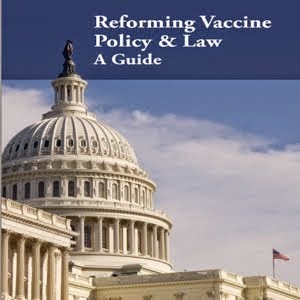 An illustrated 55-page guide published in 2014 by the non-profit National Vaccine Information Center (NVIC) that gives an overview of why vaccine safety and informed consent protections should be secured in all U.S. vaccine policies and laws. "Show Us the Science & Give Us a Choice."